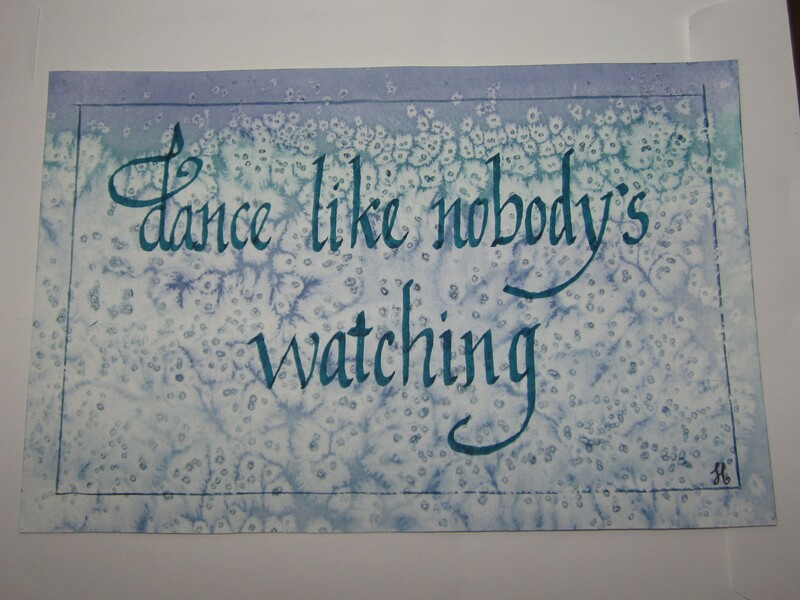 Back in April, one of my co-workers found out that I dabble in calligraphy, and he asked me to do “Dance like nobody’s watching” in calligraphy on a small sheet of paper, so he could give it to his wife. I assured him that I am no good as a calligrapher, but told him that I could probably convince my mom to do the piece, as she is an excellent scribe. I never caught her in the right moment; however, so I resolved to do it myself. I did 4 or 5 pieces that I was very dissatisfied with. Then I decided to do it on watercolor paper on top of a nice watercolor wash. I finally completed one that I was fairly happy with only to realize that I had written “Dance like nobody’s wathing.” According to the Urban Dictionary, wathing is “Stalkerishly watching someone or something bathe.” I think the most disturbing part of that definition is the part about watching “something” bathe in a stalkerish manner. Shiver. Anyway, missing the “C” changed the meaning of the phrase resolutely. So I had to start over. Again. I was working on painting an ocean scene, so my palette was already loaded with purples, greens, and blues, so I got the paper soaking wet and washed those colors over it. I then peppered the paper with kosher salt. When it was all dry, it had a neat, almost tie-dyed, effect. I drew guidelines on and went at it with a teal calligraphy pen. Man, I really need to start taking better pictures of my stuff. Anyway, it’s not awesome, and the calligraphy needs a lot of work, but I gave it to my friend yesterday, and he was really happy with it. As long as the (non-paying) customer is happy, I am happy. It only took me 6 months to complete it! Now I just need to finish my Mom (from Futurama) painting, and I’ll have a totally clean slate. On that note, Go Hawks! Weeeuuwww!